Labour Strike in India on February 28th And Politics Of Bengal! What is considered to be the voice of trade unions affiliated to most of the mainstream political parties protesting against price rise, violation of labour rights and the Government’s free market policies like disinvestment in public sector companies and privatisation of services is a matter of concern for the ruling UPA, in the centre and a fight of political superiority, in Bengal. The contest is between TMC and CPM,directly in the state. 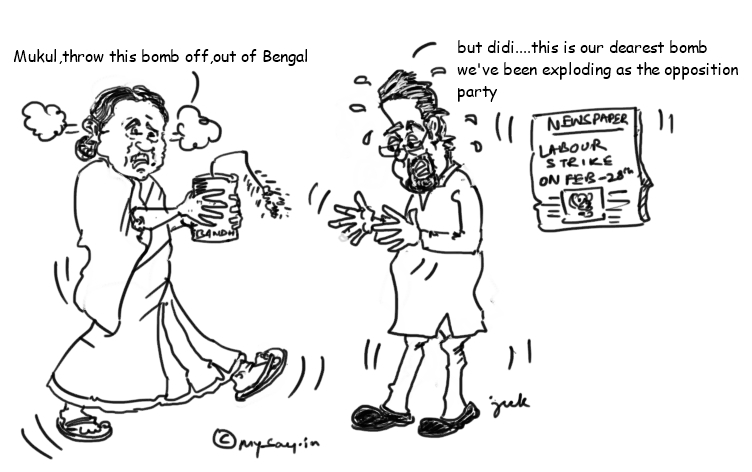 Is the core issue of strike ‘Power Test’ between TMC & CPM in Bengal ? CITU called Bandh-Industrial Strike , supported by parent CPI(M) on 28th February 2012 in Bengal today forced the CM Mamata Banerjee admit that strikes do not help any State and Nation. She also ended up apologizing to the people of Bengal for using Bandhs as strongest weapon against the ruling CPM government, in the past. She requested Bengal not to participate in the Industrial Strike and assured necessary arrangements of smooth running of government-run transports like the trains,trams,metro and government buses and warned government officials of actions against the absentees! Well, it is only after 12 hours from now will we get to know if these appeals and apologies worked for TMC as it was the same party which would frequent the state with regular Bandhs on every possible matter, mostly to show the then ruling Government, the strength and support it was generating, with every passing day.Not to forget, it has rarely been the call or support of issues and political parties, that was behind the success of all the Bandhs but it was the habit of getting used to with the unofficial holidays and spending leisure time, which had been forcing the state to accept any strikes, be it from any party.One cannot deny the chances of violence between supporters of strikes and the ones who wish to attend offices, however, it mostly became reason of a holiday, unquestioned! Today, it is the opposition which is exploding the same bomb of Strikes on the ruling TMC , mostly to show the strength, it is regaining or to check the strength, after the loss of governance. Topics are too petty to call for a strike yet no big deal if the habituated citizens of Bengal would prefer to spend a leisure time at home while the opposition would claim success of the strike and give TMC a reality-check. On the other side, it is a testing time for Mamata Banerjee , who will have to make sure the Strike has minimum impact. Although, sensing the urgency she already apologized a day before for all the strikes she promoted as opposition party and by appealing Bengal not to support the Bandh! Mamata Banerjee has indicated crackdown measures to ensure the strike doe not effect the state.